‘Learning Self-Regulation’ is Needed ‘on Path to Academic Success’ is the headline of one of my Education Week Teacher columns, and it’s the fourth in a series on self-control. Helping students developing a greater capacity for self-control is an on-going effort (and challenge) in some of my classes. I’ve written quite a bit about how I have attempted to apply recent research on the subject to my classroom practice. I’ll be including a piece on this in my upcoming third book, which is on classroom management and instructional strategies. I thought, though, that it might be useful for readers if I collected all of my related posts in a list. I was prompted by see a new video (about one of the studies I’ve written about) on the Fast Company website. Why Change Is So Hard: Self-Control Is Exhaustible with Dan Heath is a nice, short video that I’ll be using with my students next year in a new lesson (I’ll post the lesson plan over the summer). Be It Resolved is a useful column in the New York Times by John Tierney. It talks about strategies to use in sticking to New Year’s resolutions, but it’s helpful for any kind of increased effort towards self-control. Thoughts That Win talks about a new study on the use of postive self-talk. I was particularly struck about its finding that this kind of self-talk is particularly effective in when doing tasks that require endurance, which relates to self-control. These aren’t really “my posts” but they are new useful studies. Think Healthy, Eat Healthy: Scientists Show Link Between Attention and Self-Control comes from Science Daily. I’m not going to explain the experiment the article describes (you can read about it there if you’d like), but it basically reinforces the strategy that the famous marshmallow experiment found — that distracting yourself with other thoughts (and in the lesson plan in my book I emphasize positive distracting thoughts, like “Instead of throwing that paper wad at John I’m going to think about how I enjoy playing basketball with him) is an effective self-control strategy. Personality Plays Role in Body Weight: Impulsivity Strongest Predictor of Obesity is another interesting study on self-control. It says that people with little self-control “are likely to go through cycles of gaining and losing weight throughout their lives.” I could see how this would be a nice addition to my self-control lessons, and just another reason why some students might want to work on self-control now. ‘Simon Says’: Preschool-Age Kids in Different Countries Improve Academically Using Self-Regulation Game is yet another report on a self-control related study. It says that “children who regularly participated in a Simon Says-type game designed to improve self-regulation — called the Head-Toes-Knees-Shoulders task — may have better math and early literacy scores.” I didn’t feel like paying to view the entire study, but I assume the task is the one which I have seen videotaped (links to the videos are elsewhere on this list) where children are told to, say, touch their toes when the teacher actually puts her hand on her head. I’d suggest it’s not just for young children — my high school students loved doing it again, especially when they could lead it. A new study reinforces the strategy that many of use in the classroom to help students develop self-control: “partition the quantity of resources to be consumed into smaller units.” In other words, asking a student, for example, to see if he/she could focus on class work for the next ten minutes and then, the next day, try for twenty, etc. Does impatience make us fat? is an article in the Washington Post pointing out another negative result of not having self-control. How can you learn to resist temptation? reports on a new study that reinforces the importance, emphasized in follow-up reports to the marshmallow experiment, for people to prepare plans on how they are going to resist specific temptations. As I’ve previously written, I have students make these kinds of plans and draw, write, and them with classmates. I think one new aspect of this study highlights that it’s important to verbally repeat your strategy several times. Newsweek recently ran long article on people lack of self-control in spending and saving. It provides a readable overview of research on self-control, though most of it won’t be new to readers of this blog or my books. It did information on something that most of us in the classroom know already from our experience, but I hadn’t seen research on it before: reducing anxiety increases self-control. Seven ways to be good: 6) Form if-then plans is from BPS Research Digest and describes a study which found having a specific pre-planned strategy to deal with how you will respond to challenges to self-control increases the odds of successfully resisting temptation. Even though that seems fairly obvious to me, a little evidence can’t hurt. It reinforces the activity I have students do when we discuss the marshmallow plan — on one side of a paper they say and draw a potential temptation, and on the side they write and draw what they will do to distract themselves from following through on taking the action that know isn’t a good one. Mischel discovered something interesting when he studied the tiny percentage of kids who could successfully wait for the second treat. Without exception, these “high delayers” all relied on the same mental strategy: they found a way to keep themselves from thinking about the treat, directing their gaze away from the yummy marshmallow. Some covered their eyes or played hide-and-seek underneath the desk. Others sang songs, or repeatedly tied their shoelaces, or pretended to take a nap. Their desire wasn’t defeated — it was merely forgotten. Mischel refers to this skill as the “strategic allocation of attention,” and he argues that it’s the skill underlying self-control. Too often, we assume that willpower is about having strong moral fiber or gritting our teeth and staring down the treat. But that’s wrong — willpower is really about properly directing the spotlight of attention, learning how to control that short list of thoughts in working memory. It’s about realizing that if we’re thinking about the marshmallow we’re going to eat it, which is why we need to look away. Willpower and Desires: Turning Up the Volume On What You Want Most is a report on a new study on self-control. It finds that making a conscious decision to “postpone” giving in to temptation can be an effective strategy in reducing a desire (in the study’s case, eating potato chips). This got me wondering if and how I might apply this strategy in my classroom and if I even have been doing it already. For example, one of my students has been constantly using her phone to text message during class. I didn’t want to take her phone away and, instead, I made a deal with her — she could use it openly in my classroom as soon as she entered the room until the bell rang, and she could use it openly when the lunch bell rang until she left (our school has strict rules about not using cellphones during the school day). Since we made that deal, she hardly ever uses her cellphone during class (her seat is right in front of me, so it’s hard for me to not to see her). But, even more significantly, she hardly ever uses her cellphone during the times we agreed she could, either. What You Need to Know about Willpower: The Psychological Science of Self-Control is a new publication by the American Psychological Association that gives a pretty thorough review of the research. This somewhat rambling report highlights research on “ego depletion” and its effect on self-control. In summary, the study found that feeling socially rejected reduces one’s self-control ability. Yet another reason to develop more of a sense of community in the classroom. The significance of self-control is by Angela Duckworth and has lots of good annotations. It’s just another reinforcer to the idea of making small changes in student environments. For example, changing a student’s seat if he/she is having self-control issues, even if they are not connected to the classmates around them. The Marshmallow Test Pays Off, 40 Years Later is from Slate. Simon Says Don’t Use Flashcards is from The New York Times. Self-Controlled Kids Prosper as Adults: ‘Fatalistically Depressing’? is from the PBS News Hour. How having self-control as a kid can affect your health later is from The Globe and Mail. Labs worldwide report converging evidence that undermines the low-sugar theory of depleted willpower is from BPS Research Digest. I think the headline is a bit misleading, but the info in the article is interesting. Improving Willpower: How to Keep Self-Control from Flagging is from TIME. Being Sad Makes You More Impatient comes from The Harvard Business Review. It a study that found people who felt sad had great problems with self-control. fighting off impulses is just one part of a much broader and more predictive mental skill, one that scientists call cognitive control or the ability to manage your attention. That term is new to me…. Study: 80% of College Students Say They Text in Class is from The Atlantic. It’s perfect for my supplemental lesson related to the Marshmallow Test, which relates to texting. We Didn’t Eat the Marshmallow. The Marshmallow Ate Us. is from The New York Times, and makes some interesting points about the famous marshmallow experiment. Feeling Impulsive? Head for the Forest is from The Pacific Standard. It reports on a study finding that people seeing pictures of nature increased their self-control. Maybe an idea for classroom decorations? I’m a big fan of Duke professor, author and researcher Dan Ariely, and have written a lot about his work. Here’s a video of a talk he gave on self-control (you can find the transcript here). It’s really quite good. Unfortunately, I think most of the examples and stories he uses — which are great — would just be too hard for high school students to connect with, and apply to, their own situation. Inside the teenage brain: New studies explain risky behavior is from Science Daily. How Can A Parrot Help Students Develop Self-Control? A Feeling of Control: How America Can Finally Learn to Deal With Its Impulses is a very interesting piece from The Pacific Standard. Dispelling the Myth of Deferred Gratification is by Alfie Kohn and appeared in Ed Week. ‘The Marshmallow Test’: An Interview With Walter Mischel is a post I published at Education Week Teacher. I interview Walter Mischel, the creator of the famous Marshmallow Test to measure self-control and its long-term effects. “Ideas for E.L.L.s | Teaching and Learning About Work and Careers” Is My Latest NY Times Post – Here Are Extra Resources! includes lesson materials on self-control. A Feeling of Control: How America Can Finally Learn to Deal With Its Impulses is long, but may be one of the best pieces on self-control around. How To Defeat The Impulse Buy is from The New York Times. How Can We Help All Students Pass The Marshmallow Test? is by Jessica Weible at the Center For Teaching Quality. New research challenges the idea that willpower is a “limited resource” is from BPS Research Digest (though I’m not convinced). Removing yourself from temptations is one of the best recommended self-control strategies. Watch the whole clip, if you haven’t seen it before, but pay particular attention at about 1:05 into it. Research-based Strategies to Help Children Develop Self-Control is from MindShift. The Marshmallow Test: Why Trust Matters at Work is from Business.com. Replication project investigates self-control as limited resource is from Science Daily. I’ve written a lot about this concept. Some of the studies written about in this report are critical of the concept, but it also includes critiques of those studies. Replication Project Investigates Self-Control as Limited Resource is from The Association For Psychological Science. I’ve previously shared about this study (see preceding link). I like this particular resource because it also includes critiques of it from researchers who I know and respect. This Is How To Resist Distraction: 4 Secrets To Remarkable Focus is from Barking Up The Wrong Tree. Distracted much? New research may help explain why is from Science Daily. Goal attainment seems to be about avoiding temptation, not exercising willpower is from BPS Digest. Scientists “Switch Off” Self-Control Using Brain Stimulation is from Scientific American. Self-Regulation and Toxic Stress Report: Implications for Programs and Practice is the title of a lengthy report released by the Administration for Children and Families at the U.S. Department of Health and Human Services (DHHS). You can read a short summary of it here. Self-regulation is the act of managing one’s thoughts and feelings to engage in goal-directed actions such as organizing behavior, controlling impulses, and solving problems constructively. It provides lots of helpful and effective positive recommendations on how educators and others can support students develop these skills, including suggestions divided by age-levels. 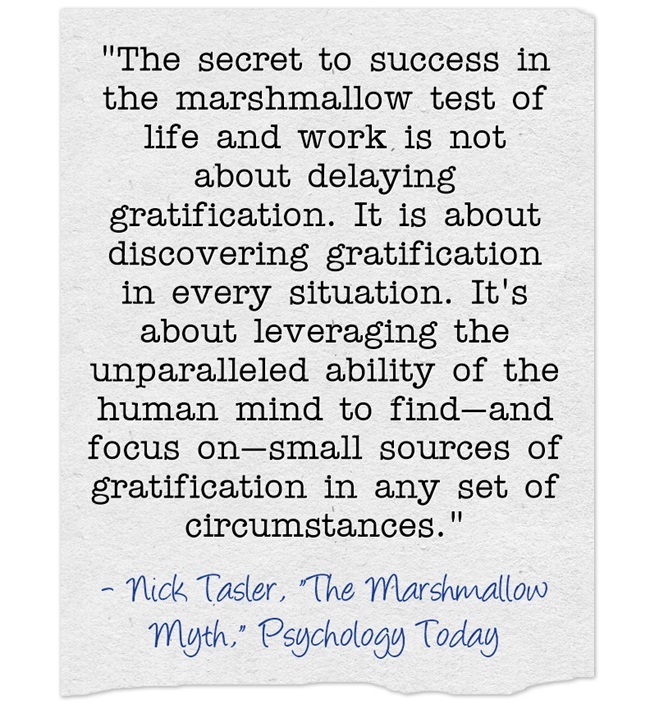 How and Why To Master The Habit of Delaying Gratification is from Fast Company. The Myth of Self-Control is from Vox. Leadership Takes Self-Control. Here’s What We Know About It is from The Harvard Business Review. Want To Teach Your Kids Self-Control? Ask A Cameroonian Farmer is from NPR. How children’s self-control has changed in the past 50 years is from The Washington Post. Ego Depletion Reduces Attention Control: Evidence from Two High-Powered Preregistered Experiments are new studies. Harnessing the Power of Prosocial Emotions for Our Future Selves is from Behavioral Scientist. Better Than Willpower is from The Atlantic. Why willpower is overrated is from Vox. Learning to Self Manage is from Usable Knowledge. Research every teacher should know: self-control and learning is from The Guardian. Softening Claims of the Marshmallow Test is by Greg Toppo. This is the best piece out there on the newly “replicated” Marshmallow Test because it has a response from Walter Mischel. Struggle With Self-Control? Take Yourself Out of the Equation is from The NY Times. Kids’ Self-Control Is Influenced by Their Peer Group is from Psychology Today. Try to Resist Misinterpreting the Marshmallow Test is from Behavior Scientist. The Character Trait That Makes People Happier is from PsyBlog. Why It’s So Hard to Put ‘Future You’ Ahead of ‘Present You’ is from The NY Times. Need More Self-Control? Try a Simple Ritual is from Scientific American. Hide Your Phone When You’re Trying to Work. Seriously. is from The NY Times. Effective Self-Control Strategies Involve Much More Than Willpower, Research Shows is from APS. A smarter way to think about willpower appeared in The Washington Post. PreviousSeventeenth Edition of The ESL/EFL/ELL Blog Carnival Is Up!